A BETTER METHOD TO CONTROL SOUND. Many spaces such as restaurants, open offices, and classrooms need an adaptive level of acoustic control that traditional solutions are unable to provide. Beyond simply reducing sound, these environments need effective absorption at high sound pressure levels (SPL), while maintaining natural, clear audibility at lower levels. SoundPly provides the solution. Nearly all acoustic systems absorb sound using porous materials, such as foam, fiberglass, cotton or felt. These materials absorbs sound energy in two methods— viscous friction between air molecules as they flow throughout the open spaces inside the material, and mechanical damping from microscopic vibrations caused by air molecules impacting the porous material’s inner structure. 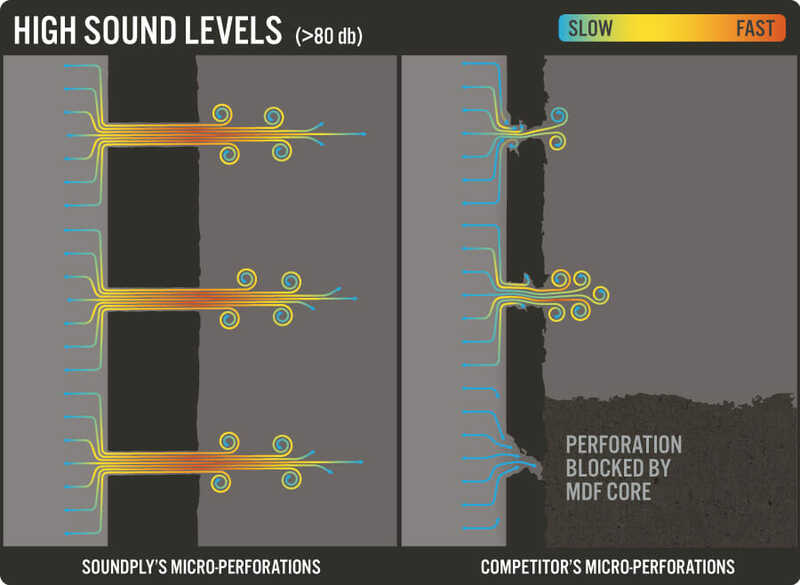 Due to the physical limitations of mechanical damping, porous materials absorb sound energy more effectively at low SPLs than at higher levels. Although increasing a porous material’s thickness improves its overall absorption capacity, it disproportionately improves the material’s low SPL absorption. This bias is problematic, since the amount of porous material needed to sufficiently address higher SPLs results in the environment sounding “dead” and unnatural at lower SPL levels, due to the excessive sound absorption. A solution using a balance of porous and resonant sound absorption has been introduced with the newest generation of SoundPly panels. The solution is called Dynamic Sound Control™ (DSC), and is only possible through the combination of SoundPly’s patented construction with the panel’s proprietary MicroPerfection® technology. Resonant absorption, in contrast to porous absorption, actually performs more efficiently as sound pressure levels increase. At low levels, resonant absorption primarily occurs through viscous friction caused by resonating air molecules inside the micro-perforation’s passages. As sound levels increase, the resonating air molecules expel out of the passage at higher velocities, projecting turbulent vortices from the panel’s surface. Through a process called vortex shedding, these vortices increase absorption efficiency by destructively interfering with the energy of succeeding sound waves. Through the innovative combination of porous and resonant absorption, SoundPly panels provide a more even, natural method of absorbing sound. At the lowest sound levels, a micro-perforated panel absorbs the smallest percentage of acoustical energy. This is because the sound wave’s energy is below the critical threshold to propagate the evacuation and resonance of air through the panel’s micro-perforations. 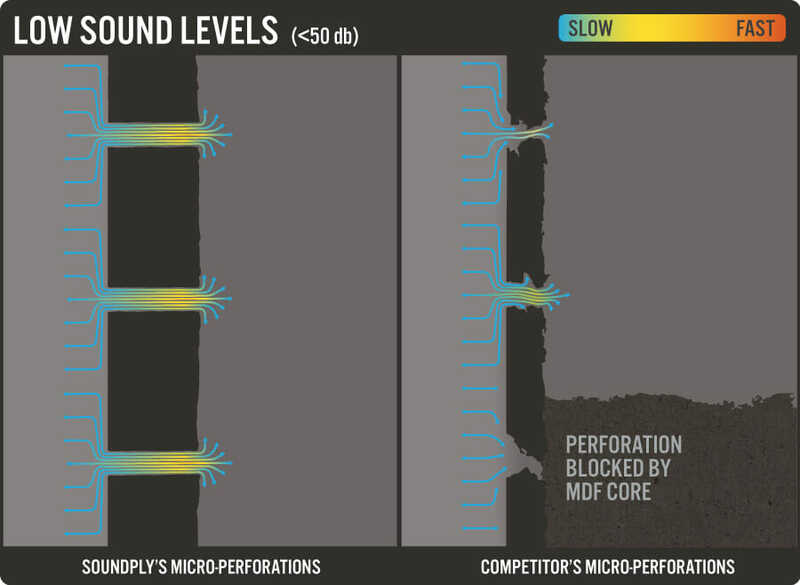 This threshold is determined by several variables including the size, pattern, spacing, depth and shape of the micro perforations, but is usually under 50 decibels. At high sound levels (over 80 decibels), an additional jetting effect, called vortex shedding, becomes the dominate method of energy absorption. Air molecules are unorganized when they enter a micro-perforation, but as they flow through the perforation, the friction between the air and the perforation’s walls organize the molecules into donut-shaped rotating vortices. Due to the high level of acoustic energy contained in the vortices, they continue rotating upon exiting the perforation, and can travel a significant distance.